The Union Advocate, official publication of the St. Paul Regional Labor Federation, received five awards in the International Labor Communications Association’s 2015 awards contest. 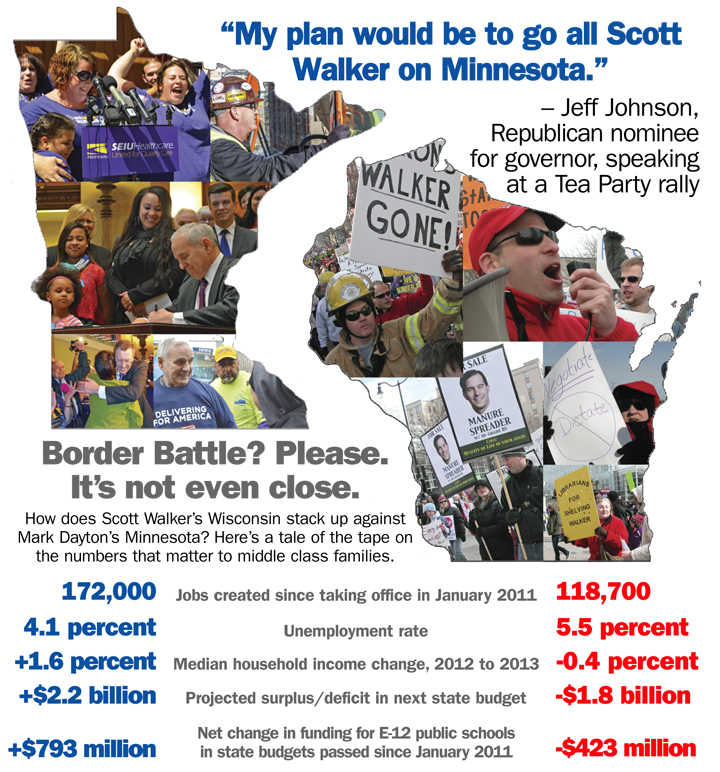 First Place, Visual Communication Awards: Best Informational Graphic, for “Border Battle,” a November 2014 graphic comparing performances of governors in Minnesota and Wisconsin since the 2010 election. First Place, Writing Awards: Saul Miller Awards / Organizing, for “Back to School, Union Strong,” an October 2014 report on historic union drives at two St. Paul charter schools. First Place, Writing Awards: Saul Miller Awards / Political Action, for “Raising Wages for 350,000 Workers,” a May 2014 report on the broad coalition of unions and community groups that successfully lobbied to raise Minnesota’s minimum wage. Third Place, Writing Awards: Best Labor History Story, for “A Model for Disaster,” a May 2014 analysis of NAFTA’s impact on workers locally and nationally over the last 30 years. Third Place, Writing Awards: Best Profile, “Stopping the Presses,” a February 2014 feature story covering workers displaced by the Pioneer Press’ plant closing. Minnesota-based AFSCME Council 5, the Minneapolis Labor Review newspaper and the University of Minnesota’s Labor Education Service, which publishes the labor-news website Workday Minnesota, also won awards this year. Click here for a list of winners from Minnesota. The awards were presented at ILCA’s 60th Anniversary Convention Sept. 24-26 in Raleigh, NC. Read more about the convention on Workday Minnesota.